Chicken Broccoli Rice Casserole is delicious, filling, frugal, and so freezer-friendly! If you freeze the bags flat, you can to fit a lot in a small freezer. To freeze: Divide into four ziptop freezer bags and seal tightly. Freeze flat. To serve: Thaw overnight (or for 8 hours) in the refrigerator. Dump into a greased casserole dish (each bag will fill an 8×8-inch pan; two bags will fill a 9×13-inch pan). Sprinkle with additional shredded cheese, if desired. Bake at 350 degrees for 25-30 minutes, or until heated through and bubbly. This recipe makes around 15-18 servings. Each freezer bag serves 4-5 people. Did you do any freezer cooking over the past two days? If so, I’d love to see the results of your efforts! Link up your blog posts below or tell us about your success in the comments. Looking for more? Read more posts about 4 Weeks to Fill Your Freezer. I had always heard that rice got mushy if you froze it? I am guessing this is wrong? Do you under cook it a bit? It can change texture a little bit, but in this particular recipe it seems to hold up well. You definitely don’t want to overcook it and you want to make sure to drain it well. Victoria, I have frozen plain cooked rice, and it comes out great! I think the most important thing is, as Crystal said, being sure it is not overcooked. Looking forward to trying this recipe–it looks delicious! The recipe calls for 2 cans of cream of mushroom, would this be the small cans or the family size? I made the chicken, broccoli and rice casserole. I only made one batch since I had not made it before but I did taste it and I should have made a double batch, it is really good. I left the cheese out of mine and made my own dairy free soup so it would be dairy free for my family. I also used some of my baking mix to make some cinnamon twist scones but they didn’t make it into the freezer. Over the weekend I got some round steak on sale and packaged some up for beef and celery, some to grill and a crockpot dish. Did you make a dairy free cream of chicken soup? If so, can you post your recipe! My family has a lot of allergies, so a lot of Crystal’s recipes as is would not be suitable. You can substitute Almond milk for the milk in the soup. Fresh Almond milk taste the best I think. I made egg mcmuffins and chicken and cheese burritos! I made 8 meals today and parts of 7 more!! I made 2 pans of chicken cordon bleu, 3 bags of sloppy joes, 3 bags of rosemary porkchops, 2lbs of taco meat, 3 lbs of meat for lasagna casserole, 1 recipe burrito filling, and 2 lbs of meat for pizza casserole!! My nine-month-pregnant ankles are swollen beyond recognition, but I know I’ll be grateful when I’m exhausted from those sleepless nights with a newborn!! Thanks for the motivation to stock the freezer!!! What size freezer bag do you use? I really want to try this! I used the large sized freezer bags. Gallon size from the looks of it, I’m guessing. i made nutter butter cookies and banana pancake muffins today. Both turned out great and the kids loved them. Thank you for including the links to the homemade soups. This looks great. I might try it with homemade cream soups so I can make it gluten free. Thanks for the inspiration. If you are making it consecutively then you can just put it in a bowl and leave it on the counter. It won’t hurt the rice to be out while you cook the rest. It will dry out if kept in the fridge for too long if there isn’t any moisture with it. It will be at least 15 minutes between each batch although I suppose I can make one in the microwave and one in the rice cooker so that I have 6 cups at once…maybe it would be best to mix the rice with the soup as soon as each batch is done? Oh yum! Sausage sounds like a great idea — I would have never thought to try that! Chicken, turkey, ham, pork (loin, chops), whatever meat you’d like would probably go well with this. I gotta get busy! Thank you!! Never knew this could be frozen, and it’s one of my family’s favorites! I know what I am doing tomorrow! Just wanted to thank you for this freezer series. I happened to find it a couple days ago. It’s PERFECT as I’m trying to prepare for the arrival of baby #4. THANK YOU!!! Is there anything to substitute for the cream soups? I really don’t like them so I stay away from any recipe that calls for them, but this looks good! You can use either canned soups or homemade cream soup (see the links for that in the recipe next to the canned soup on the ingredient list). Do you make your cream of chicken/mushroom soup or used the canned? Does it save that much $$$ to home make it? Most people make it to avoid the processed stuff in the canned soups. 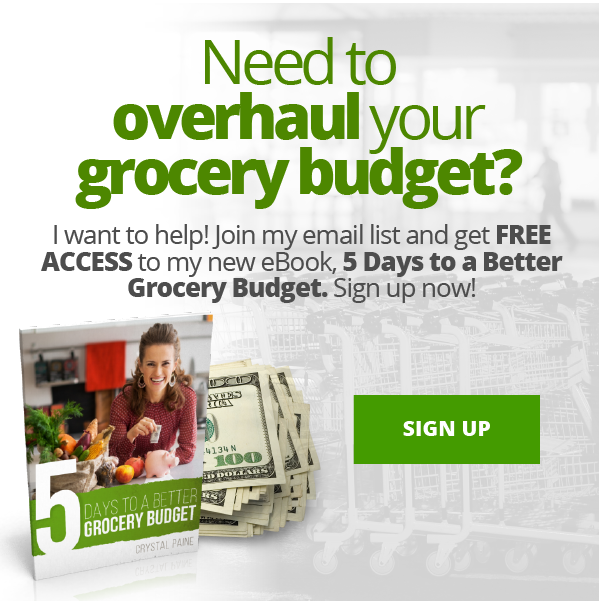 I’ve done both and would say that making it yourself is a little less expensive (not that much compared to Aldi prices) but it is definitely better for you. This looks great. I may be able to get my kids to eat broccoli with this recipe. I am very knew to freezer cooking and I have always wanted to learn how to do it. The recipes are very helpful. Seriously on my to do list. Yummo. How many whole chicken breasts to make 4 cups of chicken? 1 per cup? I usually gauge about one breast = one cup. It varies a little, but with a recipe like this (and with most recipes that you put chopped chicken in) the amount of chicken doesn’t have to be exact. We’re not big fans of the texture of frozen cooked chicken… do you think mixing it up raw would work if I extend the cooking time? I wouldn’t recommend that, but you could add the fresh-cooked chicken in before baking. Do you think you could make this and freeze a small amount in sandwhich bags to microwave on a plate for lunches at work? The rice and chicken are cooked already. And is cream soup really ready to eat even though we usually cook it, right? The cheese would melt. Yes, that would probably work. Might not be quite as yummy, but it would still be good. I’m assuming that the homemade versions of the “cream of” soups are a full soup, whereas the cans are condensed…If that’s the case, do you add the 1 can of water to your canned soup to make it the same amount as the homemade soup? No, just put them in condensed. I just made half a batch (didn’t have enough ingredients for an entire batch) and put one casserole in the oven and one in the freezer! YAY! I think this will be a winner at our house. Thank you for delicious no-fuss meals that are family friendly! May you be blessed as you ‘lead’ women to be better managers, moms and home-makers. I think I need a second freezer. Just cleaned and froze 2 cases of strawberries. And I had to juggle to fit them in the freezer. Any thoughts on baking first then freezing single servings and reheating in the microwave? I have some left over cooked pasta from Lasagna Casserole. I’ll probably use that instead of rice. Can’t wait to try this! Looks YUMMY! Have a dumb question. I have never cooked rice. Do you just get the regular rice or minute rice? Also about how many cups of uncooked rice would I need? What is the avg time to cook rice? Thanks!! I used brown rice, but white rice should work, too. Though brown rice tends to not get as mushy. I’d use about 4-5 cups uncooked rice. Brown rice takes around 30-45 minutes to cook. White rice is a little faster than that. I just made a batch of this today and I am so excited about it! This is my first freezer meal ever!! I am use to freezing my meats but I have never made a meal to freeze. I have a feeling I will be doing this so much more. Thank you for the recipe! My family makes something similar, only we mix in a little bit of light miracle whip too for a little bit of zip. With the quantites you have there, maybe 1 cup? 1.5 cups? Could I put this in the crockpot instead of baking it? It’s already getting warm outside and I want to try to avoid heating the house. Have you ever tried to cook this still frozen? I’m looking for some meals I can freeze for my husband on those days when he’s on his own for dinner. My thought is to put this into small aluminum pans into the freezer that he can just pull out and pop in the oven. Thoughts? He already knows he loves this dish. Did you try cooking from frozen? I’ve got one in the freezer in an aluminum pan and was thinking of giving it a try tonight. Help! I recently found your website and made this recipe. It is wonderful! We have several allergy issues and I was able to adapt a few things so we can all eat it. I’d like to find more recipes that are similar in budget and freezer friendly but I’m having a bit of trouble navigating your website because I keep going to outside links. Any suggestions? Holy Moly! I made this earlier in the week. DIdn’t follow directions exactly(missed about 2 cups of chicken and cheese, each), but man, oh man did I have a lot of this stuff. I had bought what I thought was 6 9 in pans, turned out to be 9, but decided to use them. Filled 6 of them. I was shocked. but threw them in the freezer and waited for the night to use them. Thawed 2 of them(cuz you never know), topped with extra cheese and served. 1 9 in pan fed all 6 of us(2 adults and 4 small-ish kids). The second was just that, seconds. I have 6 that I’m trying to make this for, what would the measurements be to make enough for 6 people? How long can this stay in the freezer for? I’m not sure what is different about what I do, but when I take the casserole out of the refrigerator and put it into the oven (I don’t have time to let it come to room temperature, since I’m doing this as I get home from work) it takes at least an hour to get hot all the way through. Under what conditions do your “25-30″ minute” cook times apply? In my family we are allergic to mushrooms. Could I use cream of celery soup instead? Has everyone baked for 25-30 minutes? It doesn’t come out overcooked and dry since all of the ingredients are already cooked? Mine comes out fine. I did leave it in the oven (it was turned off) to keep it warm for my husband when he was going to be home late, and it got dry and nasty. I wouldn’t go past 35 minutes. Everything is cooked, so if it isn’t hot, just toss your plate in the microwave for a few seconds. I have made this casserole twice. The broccoli was hard for my one year old to eat, so I used peas instead. It came out wonderful! Taste just as good after being in the freezer as it does being made fresh! Can you tell me what size (how many oz) of the cream of mushroom and cream of chicken soups you use? I think the soup cans are the standard ‘small’ size, around 10-12 ounces each. I noticed this did not call for any milk with the soups. Does this make it to salty or thick? I always make sure when I cook to make enough to freeze at least one meal. When I make my soups I use a 6 qt crockpot and freeze several bags, same with chili, spaghetti sauce, taco mix, and even just baked or boiled chicken that I can use in other dishes. I also cook hamburger with oniins and garlic so I can gave it to put in other dishes. This is for when I am busy quilting etc and don’t want to spend much time away from it!? Also there are 2 of us that eat like 6. Because we have dogs that eat with us as well. Have you ever frozen in containers instead of freezer bags? What size freezer bags do you use? I don’t do math well at all… what would be the measurements for just one meal? Love all your stuff! Quick and easy however, I found it lacked in a little flavor and was bland. Added garlic powder before putting in freezer bags which helped a bit. I think this is a good base recipe however I will adjust the season next time I made it. Try adding a little curry powder. It’s so good. Sounds like a great addition! I haven’t cooked with curry powder much. How much should I add? Do you ever put a crunchy topping on it? Yes, I always use cream of chicken soup. I don’t like mushroom soup either. I substitute cream of broccoli or broccoli cheese soup and it’s yummy. Should you use condensed soup or no? Thanks! How long will this stay good once frozen? Hi, I’m doing freezer meals because we are moving & my kitchen will be packed up in a few days. So I’m just planning on doing freezer meals & using my crock pot to cook them all. Would this turn out in a slow cooker? Otherwise, maybe I’ll just have to grab some disposable pans. Thanks! I make it similar but find that 2 jars of Cheez Whiz in place of most of the cheddar gives it a much better flavor. I also cook the rice in chicken stock. I still put shredded cheddar cheese on the top the last 5 minutes of baking time. Quite yummy! Can I use pasta instead of rice? If so which pasta and how much would you suggest?? I make this about once a week. (Not as a freezer meal.) I add minced garlic gives a little more flavor, I also use broccoli cheese soup (Panera is our favorite containers found at grocery store or Sam’s club for more reasonable price). With using that soup it also has carrots. I also added some frozen veggie mix with carrots,broccoli and cauliflower. Delicious! I did it with three cups of white rice (uncooked), so it made about nine cups once cooked, for 12 servings. I wonder if you could provide nutritional analysis information. This would be a great help to those cooking for family members with serious dietary requirements. Thank you for considering providing this option. How long will the freezer meal last in the freezer?? Мы предлагаем заказать и Купить аккумулятор mutlu у нашего менеджера.